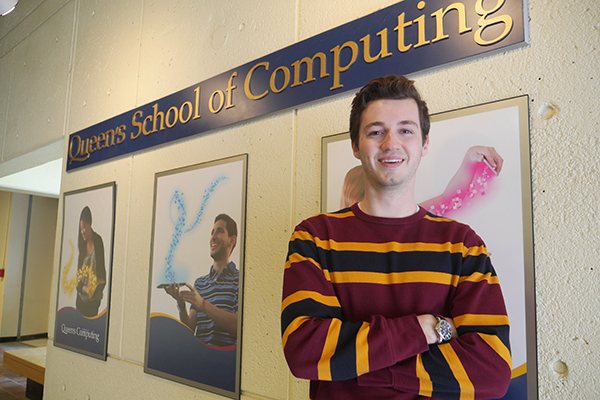 Zachary Baum (Comp‘17, MSc’19) has worked tirelessly to put Queen’s School of Computing on the map through recruiting students and strengthening the programming for their arrival on campus. Erika Campbell (Artsci’19) has addressed the topics of consent and mental health and has been involved in initiatives on main campus and the Bader International Study Centre. Benji Christie (Sc’19) has been involved in shaping the extra-curricular and academic experiences of students as a member of the Engineering Advisory Board, Alumni Relations Committee, and the Campus Bookstore Board of Directors. Olivia Rondeau (Ed’19) is deeply connected with Indigenous communities throughout her time as a teacher candidate and has developed and publicized classroom resources on indigeneity. She is committed to sharing her knowledge with all teachers. Ampai Thammachack (Artsci’20) has made an impact on marginalized communities and mental health at Queen’s and beyond, raising awareness and funding through her charities Step Above Stigma and Glass Slipper. Five students at Queen’s are set to receive the Agnes Benidickson Tricolour Award, one of the highest honours a student can receive from the university. Students are selected for their distinguished service to the university in non-athletic, extra-curricular activities, with the three tenets being service, leadership, character. Zachary Baum (Comp‘17, MSc’19) – A transformative leader who has worked tirelessly to put Queen’s School of Computing on the map, Zac has been key in recruiting students to Queen’s while simultaneously strengthening the programming they will be met with upon their arrival on campus. Erika Shannon Campbell (Artsci’19) – A role model in the truest sense of the word, Erika has addressed the topics of consent and mental health by taking an educational and preventative approach. Using an intersectional mindset, Erika has been a part of various initiatives that make both main campus and The Bader International Study Centre safer and more inclusive places. Benji Christie (Sc’19) – A true servant in his commitment to the Faculty of Engineering and Applied Science, Benji has been involved broadly and deeply in shaping the extra-curricular and academic experiences of his fellow students. From the Engineering Advisory Board, to Alumni Relations Committee, to the Board of Directors for the Campus Bookstore at Queen’s, Benji has explored unique ways of making his mark on the community. Olivia Rondeau (Ed’19) – A passionate champion of education in her time at Queen’s, Olivia has become deeply connected with Indigenous communities and has gone above and beyond her capacity as a teacher candidate. Developing and publicizing classroom resources on indigeneity, Olivia is committed to sharing her knowledge with all teachers. Ampai Thammachack (Artsci’20) – A humble and resilient leader, Ampai has made an undeniable impact on marginalized communities and mental health at Queen’s and beyond. Through her charities Step Above Stigma and Glass Slipper, Ampai has raised awareness and funding that is transformative. The Agnes Benidickson Tricolour Award and induction in the Tricolour Society is the highest tribute that can be paid to a student for valuable and distinguished service to the university in non-athletic, extra-curricular activities. The award is named after Agnes Benidickson who was chancellor of Queen’s from 1980 until 1996. Other notable Tricolour Award recipients include: former Member of Parliament and father of the Canadian flag John Matheson (Arts’40, DSA’77, LLD’84); former Bank of Canada Governor and Queen’s Chancellor Emeritus David Dodge (Arts’65, LLD’02); Dragons’ Den TV star Michele Romanow (Sc’07, MBA’08); and Emmy Award-winning filmmaker Peter Raymont (Arts’72). This year’s recipients will be honoured at a ceremony on April 6 at Grant Hall.